Olmsted Locks and Dam has been under construction for over 20 years under the US Army Corps of Engineers' watch. Colonel Debra Lewis, the Gulf Region Division Central District commander with Sheik O'rhaman Hama Raheem, an Iraqi councilman, celebrate the opening of a new women's center in Assriya Village that the Corps helped construct in 2006. U.S. Army Corps of Engineers dredge Tauracavor 3 in New York Harbor. The United States Army Corps of Engineers (USACE) is a U.S. federal agency under the Department of Defense and a major Army command made up of some 37,000 civilian and military personnel, making it one of the world's largest public engineering, design, and construction management agencies. Although generally associated with dams, canals and flood protection in the United States, USACE is involved in a wide range of public works throughout the world. The Corps of Engineers provides outdoor recreation opportunities to the public, and provides 24% of U.S. hydropower capacity. The corps' mission is to "Deliver vital public and military engineering services; partnering in peace and war to strengthen our Nation's security, energize the economy and reduce risks from disasters." Planning, designing, building, and operating locks and dams. Other civil engineering projects include flood control, beach nourishment, and dredging for waterway navigation. Design and construction of flood protection systems through various federal mandates. Design and construction management of military facilities for the Army, Air Force, Army Reserve and Air Force Reserve and other Defense and Federal agencies. Environmental regulation and ecosystem restoration. The history of United States Army Corps of Engineers can be traced back to 16 June 1775, when the Continental Congress organized an army with a chief engineer and two assistants. Colonel Richard Gridley became General George Washington's first chief engineer. One of his first tasks was to build fortifications near Boston at Bunker Hill. The Continental Congress recognized the need for engineers trained in military fortifications and asked the government of King Louis XVI of France for assistance. Many of the early engineers in the Continental Army were former French officers. Louis Lebègue Duportail, a lieutenant colonel in the French Royal Corps of Engineers, was secretly sent to America in March 1777 to serve in Washington's Continental Army. In July 1777 he was appointed colonel and commander of all engineers in the Continental Army, and in November 17, 1777, he was promoted to brigadier general. When the Continental Congress created a separate Corps of Engineers in May 1779 Duportail was designated as its commander. In late 1781 he directed the construction of the allied U.S.-French siege works at the Battle of Yorktown. From 1794 to 1802 the engineers were combined with the artillery as the Corps of Artillerists and Engineers. The Corps of Engineers, as it is known today, came into existence on 16 March 1802, when President Thomas Jefferson signed the Military Peace Establishment Act whose aim was to "organize and establish a Corps of Engineers ... that the said Corps ... shall be stationed at West Point in the State of New York and shall constitute a military academy." Until 1866, the superintendent of the United States Military Academy was always an officer of engineer. The General Survey Act of 1824 authorized the use of Army engineers to survey road and canal routes. That same year, Congress passed an "Act to Improve the Navigation of the Ohio and Mississippi Rivers" and to remove sand bars on the Ohio and "planters, sawyers, or snags" (trees fixed in the riverbed) on the Mississippi, for which the Corps of Engineers was the responsible agency. Separately authorized on 4 July 1838, the U.S. Army Corps of Topographical Engineers consisted only of officers and was used for mapping and the design and construction of federal civil works and other coastal fortifications and navigational routes. It was merged with the Corps of Engineers on 31 March 1863, at which point the Corps of Engineers also assumed the Lakes Survey District mission for the Great Lakes. In 1841, Congress created the Lake Survey. The survey, based in Detroit, Mich., was charged with conducting a hydrographical survey of the Northern and Northwestern Lakes and preparing and publishing nautical charts and other navigation aids. The Lake Survey published its first charts in 1852. In the mid-19th century, Corps of Engineers' officers ran Lighthouse Districts in tandem with U.S. Naval officers. The Army Corps of Engineers played a significant role in the American Civil War. Many of the men who would serve in the top leadership in this institution were West Point graduates who rose to military fame and power during the Civil War. Some of these men were Union Generals George McClellan, Henry Halleck, George Meade, and Confederate generals Robert E. Lee, Joseph Johnston, and P.G.T. Beauregard. The versatility of officers in the Army Corps of Engineers contributed to the success of numerous missions throughout the Civil War. They were responsible for building pontoon and railroad bridges, forts and batteries, the destruction of enemy supply lines, and the construction of roads. The Union forces were not the only ones to employ the use of engineers throughout the war, and on 6 March 1861, once the South had seceded from the Union, among the different acts passed at the time, a provision was included that called for the creation of a Confederate Corps of Engineers. The progression of the war demonstrated the South's disadvantage in engineering expertise; of the initial 65 cadets who resigned from West Point to accept positions with the Confederate Army, only seven were placed in the Corps of Engineers. To overcome this obstacle, the Confederate Congress passed legislation that gave a company of engineers to every division in the field; by 1865, they actually had more engineer officers serving in the field of action than the Union Army. One of the main projects for the Army Corps of Engineers was constructing railroads and bridges, which Union forces took advantage of because railroads and bridges provided access to resources and industry. One area where the Confederate engineers were able to outperform the Union Army was in the ability to build fortifications that were used both offensively and defensively along with trenches that made them harder to penetrate. This method of building trenches was known as the zigzag pattern. From the beginning, many politicians wanted the Corps of Engineers to contribute to both military construction and works of a civil nature. Assigned the military construction mission on 1 December 1941 after the Quartermaster Department struggled with the expanding mission, the Corps built facilities at home and abroad to support the U.S. Army and Air Force. During World War II the mission grew to more than 27,000 military and industrial projects in a $15.3 billion mobilization program. Included were aircraft, tank assembly, and ammunition plants, camps for 5.3 million soldiers, depots, ports, and hospitals, as well as the Manhattan Project, and the Pentagon. In 1944, specially trained army combat engineers were assigned to blow up underwater obstacles and clear defended ports during the invasion of Normandy. During World War II, the Army Corps of Engineers in the European Theater of Operations was responsible for building numerous bridges, including the first and longest floating tactical bridge across the Rhine at Remagen, and building or maintaining roads vital to the Allied advance across Europe into the heart of Germany. In the Pacific theater, the Pioneer troops were formed, a hand-selected unit of volunteer Army combat engineers trained in jungle warfare, knife fighting, and unarmed jujitsu (hand-to-hand combat) techniques. Working in camouflage, the Pioneers cleared jungle and prepared routes of advance and established bridgeheads for the infantry as well as demolishing enemy installations. Five commanding generals (chiefs of staff after the 1903 reorganization) of the United States Army held engineer commissions early in their careers. All transferred to other branches before rising to the top. They were Alexander Macomb, George B. McClellan, Henry W. Halleck, Douglas MacArthur, and Maxwell D. Taylor. The General Survey Act of 1824 authorized use of army engineers to survey roads and canals. The next month, an act to improve navigation on the Ohio and Mississippi rivers initiated the Corps of Engineers' permanent civil works construction mission. Although the 1824 act to improve the Mississippi and Ohio rivers is often called the first rivers and harbors legislation, the act passed in 1826 was the first to combine authorizations for both surveys and projects, thereby establishing a pattern that continues to the present day. King Khalid Military City 1973–1987. Occasional civil disasters, including the Great Mississippi Flood of 1927, resulted in greater responsibilities for the Corps of Engineers. The aftermath of Hurricane Katrina in New Orleans provides another example of this. The Chief of Engineers and Commanding General of U.S. Army Corps of Engineers works under the civilian oversight of the Assistant Secretary of the Army (Civil Works). Three deputy commanding generals report to the chief of engineers, who have the following titles: Deputy Commanding General, Deputy Commanding General for Civil and Emergency Operation, and Deputy Commanding General for Military and International Operations. The Corps of Engineers headquarters is located in Washington, D.C. The headquarters staff is responsible for Corps of Engineers policy and plans the future direction of all other USACE organizations. It comprises the executive office and 17 staff principals. USACE has two directors who head up Military Programs and Civil Works, Director of Military Programs and Director of Civil Works. The U.S. Army Corps of Engineers is organized geographically into eight permanent divisions, one provisional division, one provisional district, and one research command reporting directly to the HQ. Within each division, there are several districts. Districts are defined by watershed boundaries for civil works projects and by political boundaries for military projects. Great Lakes and Ohio River Division (LRD), located in Cincinnati. Reaches from the St Lawrence Seaway, across the Great Lakes, down the Ohio River Valley to the Tennessee and Cumberland rivers. Covers 355,300 square miles (920,000 km2), parts of 17 states. Serves 56 million people. Its seven districts are located in Buffalo, Chicago, Detroit, Louisville, Nashville, Pittsburgh, and Huntington, West Virginia. The division commander serves on two national and international decision-making bodies: co-chair of the Lake Superior, Niagara, and Ontario/St Lawrence Seaway boards of control; and the Mississippi River Commission. Mississippi Valley Division (MVD), located in Vicksburg, Mississippi. Reaches from Canada to the Gulf of Mexico. Covers 370,000 square miles (960,000 km2), and portions of 12 states bordering the Mississippi River. Serves 28 million people. Its six districts are located in St. Paul, Minnesota, Rock Island, Illinois, St. Louis, Memphis, Vicksburg, and New Orleans. MVD serves as headquarters for the Mississippi River Commission. North Atlantic Division (NAD), headquartered at Fort Hamilton in Brooklyn, New York. Reaches from Maine to Virginia, including the District of Columbia, with an overseas mission to provide engineering, construction, and project management services to the U.S. European Command and U.S. Africa Command. Serves 62 million people. Its six districts are located in New York City, Philadelphia, Baltimore, Norfolk, Concord, Massachusetts, and Wiesbaden, Germany. NAD has the largest Superfund program in USACE with 60% of the funding. NAD's Europe District has done work in dozens of countries and currently has offices in Germany, Belgium, Italy, Turkey, Georgia, Romania, Bulgaria, Israel, Spain, and soon Botswana. Northwestern Division (NWD), located in Portland, Oregon. Reaches from Canada to California, and from the Pacific Ocean to Missouri. Covers nearly 1,000,000 square miles (2,600,000 km2) in all or parts of 14 states. Its five districts are located in Omaha, Portland, Seattle, Kansas City, and Walla Walla. NWD has 35% of the total Corps of Engineers' water storage capacity and 75% of the total hydroelectric capacity. Pacific Ocean Division (POD), located at Fort Shafter, Hawaii. Reaches across 12 million square miles of the Pacific Ocean from the Arctic Circle to American Samoa below the equator and across the International Date Line, and into Asia. includes the territories of Guam, American Samoa and the Commonwealth of the Northern Mariana Islands as well as the Freely Associated States including the Republic of Palau, Federated States of Micronesia and the Republic of the Marshall Islands. Its four districts are located in Japan; Seoul, South Korea; Anchorage, Alaska; and Honolulu. Unlike other military work, POD designs and builds for all of the military services — Army, Navy, Air Force, Marines — in Japan, Korea, and Kwajalein Atoll. South Atlantic Division (SAD), located in Atlanta. Reaches from North Carolina to Alabama as well as the Caribbean, and Central and South America. Covers all or parts of six states. Its five districts are located in Wilmington, North Carolina, Charleston, South Carolina, Savannah, Jacksonville, and Mobile. One-third of the stateside Army and one-fifth of the stateside Air Force are located within the division boundaries. The largest single environmental restoration project in the world — the Everglades Restoration — is managed by SAD. South Pacific Division (SPD), located in San Francisco. Reaches from California to Colorado and New Mexico. Covers all or parts of seven states. Its four districts are located in Albuquerque, Los Angeles, Sacramento, and San Francisco. Its region is host to 18 of the 25 fastest-growing metropolitan areas in the nation. Southwestern Division (SWD), located in Dallas. Reaches from Mexico to Kansas. Covers all or part of seven states. Its four districts are located in Little Rock, Tulsa, Galveston, and Fort Worth. SWD's recreation areas are the most visited in USACE with more than 11,400 miles (18,300 km) of shoreline and 1,172 recreation sites. Transatlantic Division (TAD), located in Winchester, Virginia. Supports Federal programs and policies overseas. Consists of the Gulf Region District, the Afghanistan Engineer District South, the Afghanistan Engineer District North, the Middle East District, the USACE Deployment Center and the TAD G2 Intelligence Fusion Center. TAD oversees thousands of projects overseas. TAD overseas locations are staffed primarily by civilian volunteers from throughout USACE. The Corps of Engineers built much of the original Ring Road in the early 1960s and returned in 2002. Supports the full spectrum of regional support, including the Afghan National Security Forces, U.S. and Coalition Forces, Counter Narcotics and Border Management, Strategic Reconstruction support to USAID, and the Commander's Emergency Response Program. U.S. Army Engineer units outside of USACE Districts and not listed below fall under the Engineer Regiment of the U.S. Army Corps of Engineers. Army engineers include both combat engineers and support engineers more focused on construction and sustainment. 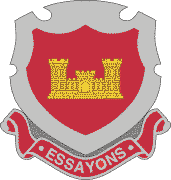 The vast majority of military personnel in the United States Army Corps of Engineers serve in this Engineer Regiment. The Engineer Regiment is headquartered at Fort Leonard Wood, MO and is commanded by the Engineer Commandant, currently a position filled by an Army Brigadier General from the Engineer Branch. The Engineer Regiment includes the U.S. Army Engineer School (USAES) which publishes its mission as: Generate the military engineer capabilities the Army needs: training and certifying Soldiers with the right knowledge, skills, and critical thinking; growing and educating professional leaders; organizing and equipping units; establishing a doctrinal framework for employing capabilities; and remaining an adaptive institution in order to provide Commanders with the freedom of action they need to successfully execute Unified Land Operations. Humphreys Engineer Center Support Activity (CEHEC) — provides administrative and operational support for Headquarters, U.S. Army Corps of Engineers and various field offices. Army Geospatial Center (AGC) — provides geospatial information, standards, systems, support, and services across the Army and the Department of Defense. Institute for Water Resources (IWR) — supports the Civil Works Directorate and other Corps of Engineers commands by developing and applying new planning evaluation methods, policies and data in anticipation of changing water resources management conditions. USACE Logistics Activity (ULA)- Provides logistics support to the Corps of Engineers including supply, maintenance, readiness, materiel, transportation, travel, aviation, facility management, integrated logistics support, management controls, and strategic planning. Enterprise Infrastructure Services (CEEIS) — designs information technology standards for the Corps, including automation, communications, management, visual information, printing, records management, and information assurance. CEEIS outsources the maintenance of its IT services, forming the Army Corps of Engineers Information Technology (ACE-IT). ACE-IT is made up of both civilian government employees and contractors. Deployable Tactical Operations System (DTOS) — provides mobile command and control platforms in support of the quick ramp-up of initial emergency response missions for the Corps. DTOS is a system designed to respond to District, Division, National, and International events. Until 2001 local Directorates of Engineering and Housing (DEH), being constituents of the USACE, had been responsible for the housing, infrastructure and related tasks as environmental protection, garbage removal and special fire departments or fire alarm coordination centers in the garrisons of the U.S. Army abroad as in Europe (e.g. Germany, as in Berlin, Wiesbaden, Karlsruhe etc.) Subsequently, a similar structure called DPWs (Directorates of Public Works), subordinate to the United States Army Installation Management Command, assumed the tasks formerly done by the DEHs. 249th Engineer Battalion (Prime Power) — generates and distributes prime electrical power in support of fighting wars, disaster relief, stability and support operations as well as provides advice and technical assistance in all aspects of electrical power and distribution systems. 911th Engineer Company — (formerly the MDW Engineer Company) provides specialized technical search and rescue support for the Washington, D.C. metropolitan area; it is also a vital support member of the Joint Force Headquarters National Capital Region, which is charged with the homeland security of the United States capital region. 412th Theater Engineer Command, U.S. Army Reserve, located in Vicksburg, MS.
416th Theater Engineer Command, U.S. Army Reserve, located in Darien, IL. 20th Engineer Brigade soldiers construct a bridge on the Euphrates River. USACE provides support directly and indirectly to the warfighting effort. They build and help maintain much of the infrastructure that the Army and the Air Force use to train, house, and deploy troops. USACE built and maintained navigation systems and ports provide the means to deploy vital equipment and other material. Corps of Engineers Research and Development (R&D) facilities help develop new methods and measures for deployment, force protection, terrain analysis, mapping, and other support. USACE directly supports the military in the battle zone, making expertise available to commanders to help solve or avoid engineering (and other) problems. Forward Engineer Support Teams, FEST-A's or FEST-M's, may accompany combat engineers to provide immediate support, or to reach electronically into the rest of USACE for the necessary expertise. A FEST-A team is an eight-person detachment; a FEST-M is approximately 36. These teams are designed to provide immediate technical-engineering support to the warfighter or in a disaster area. Corps of Engineers' professionals use the knowledge and skills honed on both military and civil projects to support the U.S. and local communities in the areas of real estate, contracting, mapping, construction, logistics, engineering, and management experience. This work currently includes support for rebuilding Iraq, establishing Afghanistan infrastructure, and supporting international and inter-agency services. In addition, the work of almost 26,000 civilians on civil-works programs throughout USACE provide a training ground for similar capabilities worldwide. USACE civilians volunteer for assignments worldwide. For example, hydropower experts have helped repair, renovate, and run hydropower dams in Iraq in an effort to help get Iraqis to become self-sustaining. USACE supports the United States' Department of Homeland Security and the Federal Emergency Management Agency (FEMA) through its security planning, force protection, research and development, disaster preparedness efforts, and quick response to emergencies and disasters. The CoE conducts its emergency response activities under two basic authorities — the Flood Control and Coastal Emergency Act (Pub.L. 84–99), and the Stafford Disaster Relief and Emergency Assistance Act (Pub.L. 93–288). In a typical year, the Corps of Engineers responds to more than 30 Presidential disaster declarations, plus numerous state and local emergencies. Emergency responses usually involve cooperation with other military elements and Federal agencies in support of State and local efforts. Work comprises engineering and management support to military installations, global real estate support, civil works support (including risk and priorities), operations and maintenance of Federal navigation and flood control projects, and monitoring of dams and levees. More than 67 percent of the goods consumed by Americans and more than half of the nation's oil imports are processed through deepwater ports maintained by the Corps of Engineers, which maintains more than 12,000 miles (19,000 km) of commercially navigable channels across the U.S. In both its Civil Works mission and Military Construction program, the Corps of Engineers is responsible for billions of dollars of the nation's infrastructure. For example, USACE maintains direct control of 609 dams, maintains or operates 257 navigation locks, and operates 75 hydroelectric facilities generating 24% of the nation's hydropower and three percent of its total electricity. USACE inspects over 2,000 Federal and non-Federal levees every two years. Four billion gallons of water per day are drawn from the Corps of Engineers' 136 multi-use flood control projects comprising 9,800,000 acre feet (12.1 km3) of water storage, making it one of the United States' largest water supply agencies. The 249th Engineer Battalion (Prime Power), the only active duty unit in USACE, generates and distributes prime electrical power in support of warfighting, disaster relief, stability and support operations as well as provides advice and technical assistance in all aspects of electrical power and distribution systems. The battalion deployed in support of recovery operations after 9/11 and was instrumental in getting Wall Street back up and running within a week. The battalion also deployed in support of post-Katrina operations. All of this work represents a significant investment in the nation's resources. Through its Civil Works program, USACE carries out a wide array of projects that provide coastal protection, flood protection, hydropower, navigable waters and ports, recreational opportunities, and water supply. Work includes coastal protection and restoration, including a new emphasis on a more holistic approach to risk management. As part of this work, USACE is the number one provider of outdoor recreation in the U.S., so there is a significant emphasis on water safety. Army involvement in works "of a civil nature," including water resources, goes back almost to the origins of the U.S. Over the years, as the nation's needs have changed, so have the Army's Civil Works missions. Navigation. Supporting navigation by maintaining and improving channels was the Corps of Engineers' earliest Civil Works mission, dating to Federal laws in 1824 authorizing the Corps to improve safety on the Ohio and Mississippi Rivers and several ports. Today, the Corps of Engineers maintains more than 12,000 miles (19,000 km) of inland waterways and operates 235 locks. These waterways—a system of rivers, lakes and coastal bays improved for commercial and recreational transportation—carry about ​1⁄6 of the nation's inter-city freight, at a cost per ton-mile about ​1⁄2 that of rail or ​1⁄10 that of trucks. USACE also maintains 300 commercial harbors, through which pass 2,000,000,000 short tons (1.8×109 metric tons) of cargo a year, and more than 600 smaller harbors. New locks are needed, according to the Corps and barge shippers, where existing locks are in poor condition, requiring frequent closures for repairs, and/or because a lock’s size causes delays for barge tows. Flood Risk Management. The Engineers were first called upon to address flood problems along the Mississippi river in the mid-19th century. They began work on the Mississippi River and Tributaries Flood Control Project in 1928, and the Flood Control Act of 1936 gave the Corps the mission to provide flood protection to the entire country. Recreation. The Corps of Engineers is the nation's largest provider of outdoor recreation, operating more than 2,500 recreation areas at 463 projects (mostly lakes) and leasing an additional 1,800 sites to state or local park and recreation authorities or private interests. USACE hosts about 360 million visits a year at its lakes, beaches and other areas, and estimates that 25 million Americans (one in ten) visit a Corps' project at least once a year. Supporting visitors to these recreation areas generates 600,000 jobs. Hydroelectric Power. The Corps of Engineers was first authorized to build hydroelectric plants in the 1920s, and today operates 75 power plants, producing one fourth of the nation's hydro-electric power—or three percent of its total electric energy. This makes USACE the fifth largest electric supplier in the United States. Shore Protection. With a large proportion of the U.S. population living near our sea and lake shores, and an estimated 75% of U.S. vacations being spent at the beach, there has been Federal interest — and a Corps of Engineers mission — in protecting these areas from hurricane and coastal storm damage. Dam Safety. The Corps of Engineers develops engineering criteria for safe dams, and conducts an active inspection program of its own dams. Water Supply. The Corps first got involved in water supply in the 1850s, when they built the Washington Aqueduct. Today USACE reservoirs supply water to nearly 10 million people in 115 cities. In the drier parts of the Nation, water from Corps reservoirs is also used for agriculture. Water Safety. The Corps of Engineers has taken an interest in recreational water safety, with current initiatives for increasing the use rate of life jackets and preventing the use of alcohol while boating. The U.S. Army Corps of Engineers environmental mission has two major focus areas: restoration and stewardship. The Corps supports and manages numerous environmental programs, that run the gamut from cleaning up areas on former military installations contaminated by hazardous waste or munitions to helping establish/reestablish wetlands that helps endangered species survive. Some of these programs include Ecosystem Restoration, Formerly Used Defense Sites, Environmental Stewardship, EPA Superfund, Abandoned Mine Lands, Formerly Utilized Sites Remedial Action Program, Base Realignment and Closure, 2005, and Regulatory. This mission includes education as well as regulation and cleanup. The U.S. Army Corps of Engineers has an active environmental program under both its Military and Civil Programs. The Civil Works environmental mission that ensures all USACE projects, facilities and associated lands meet environmental standards. The program has four functions: compliance, restoration, prevention, and conservation. The Corps also regulates all work in wetlands and waters of the United States. A member of the Radiation Safety Support Team, wearing a hazmat suit, tests excavated soil. See also Environmental Enforcement below. Completed (and continuing work on) thousands of infrastructure projects in Iraq at an estimated cost over $9 billion: school projects (324,000 students), crude oil production 3 million barrels per day (480,000 m3/d), potable water projects (3.9 million people (goal 5.2 million)), fire stations, border posts, prison/courthouse improvements, transportation/communication projects, village road/expressways, railroad stations, postal facilities, and aviation projects. More than 90 percent of the USACE construction contracts have been awarded to Iraqi-owned businesses — offering employment opportunities, boosting the economy, providing jobs, and training, promoting stability and security where before there was none. Consequently, the mission is a central part of the U.S. exit strategy. The Corps of Engineers has one of the strongest Small Business Programs in the Army—Each year, approximately 33% of all contract dollars are obligated with Small Businesses, Small Disadvantaged Businesses, Service Disabled Veteran Owned Small Businesses, Women Owned Small Businesses, Historically Underutilized Business Zones, and Historically Black Colleges and Universities. Jackie Robinson-Burnette was named the Chief of the Corps' Small Business Program in May 2010. The program is managed through an integrated network of over 60 Small Business Advisors, 8 Division Commanders, 4 Center Directors, and 45 District Commanders. The regulatory program is authorized to protect the nation's aquatic resources. USACE personnel evaluate permit applications for essentially all construction activities that occur in the nation's waters, including wetlands. Two primary authorities granted to the Army Corps of Engineers by Congress fall under Section 10 of the Rivers and Harbors Act and Section 404 of the Clean Water Act. Section 10 of the Rivers and Harbors Act of 1899 (codified in Chapter 33, Section 403 of the United States Code) gave the Corps authority over navigable waters of the United States, defined as "those waters that are subject to the ebb and flow of the tide and/or are presently being used, or have been used in the past, or may be susceptible for use to transport interstate or foreign commerce." Section 10 covers construction, excavation, or deposition of materials in, over, or under such waters, or any work that would affect the course, location, condition or capacity of those waters. Actions requiring section 10 permits include structures (e.g., piers, wharfs, breakwaters, bulkheads, jetties, weirs, transmission lines) and work such as dredging or disposal of dredged material, or excavation, filling or other modifications to the navigable waters of the United States. The Coast Guard also has responsibility for permitting the erection or modification of bridges over navigable waters of the U.S.
Another of the major responsibilities of the Army Corps of Engineers is administering the permitting program under Section 404 of the Federal Water Pollution Control Act of 1972, also known as the Clean Water Act. The Secretary of the Army is authorized under this act to issue permits for the discharge of dredged and fill material in waters of the United States, including adjacent wetlands. The geographic extent of waters of the United States subject to section 404 permits fall under a broader definition and include tributaries to navigable waters and adjacent wetlands. The engineers must first determine if the waters at the project site are jurisdictional and subject to the requirements of the section 404 permitting program. Once jurisdiction has been established, permit review and authorization follows a sequence process that encourages avoidance of impacts, followed by minimizing impacts and, finally, requiring mitigation for unavoidable impacts to the aquatic environment. This sequence is described in the section 404(b)(1) guidelines. There are three types of permits issued by the Corps of Engineers: Nationwide, Regional General, and Individual. 80% of the permits issued are nationwide permits, which include 50 general type of activities for minimal impacts to waters of the United States, as published in the Federal Register. Nationwide permits are subject to a reauthorization process every 5 years, with the most recent reauthorization occurring in March, 2012. To gain authorization under a nationwide permit, an applicant must comply with the terms and conditions of the nationwide permit. Select nationwide permits require preconstruction notification to the applicable corps district office notifying them of his or her intent, type and amount of impact and fill in waters, and a site map. Although the nationwide process is fairly simple, corps approval must be obtained before commencing with any work in waters of the United States. Regional general permits are specific to each corps district office. Individual permits are generally required for projects that impact greater than 0.5 acres (2,000 m2) of waters of the United States. Individual permits are required for activities that result in more than minimal impacts to the aquatic environment. The Corps of Engineers has two research organizations, the Engineer Research and Development Center (ERDC) and the Army Geospatial Center (AGC). AGC coordinates, integrates, and synchronizes geospatial information requirements and standards across the Army and provides direct geospatial support and products to warfighters. See also Geospatial Information Officer. A current tradition was established with the "Gold Castles" branch insignia of General of the Army Douglas MacArthur, West Point Class of 1903, who served in the Corps of Engineers early in his career and had received the two pins as a graduation gift of his family. In 1945, near the conclusion of World War II, General MacArthur gave his personal pins to his Chief Engineer, General Leif J. Sverdrup. On 2 May 1975, upon the 200th anniversary of the Corps of Engineers, retired General Sverdrup, who had civil engineering projects including the landmark 17-mile (27 km)-long Chesapeake Bay Bridge-Tunnel to his credit, presented the Gold Castles to then-Chief of Engineers Lieutenant General William C. Gribble, Jr., who had also served under General MacArthur in the Pacific. General Gribble then announced a tradition of passing the insignia along to future Chiefs of Engineers, and it has been done so since. Secretary of the Army Francis J. Harvey (r) discusses U.S. Army Corps of Engineers operations in New Orleans with Brigadier General Robert Crear, commander, Mississippi Valley Division, USACE in New Orleans, 2006. Some of the Corps of Engineers' civil works projects have been characterized in the press as being pork barrel or boondoggles such as the New Madrid Floodway Project and the New Orleans flood protection. Projects have allegedly been justified based on flawed or manipulated analyses during the planning phase. Some projects are said to have created profound detrimental environmental effects or provided questionable economic benefit such as the Mississippi River– Gulf Outlet in southeast Louisiana. Faulty design and substandard construction have been cited in the failure of levees in the wake of Hurricane Katrina that caused flooding of 80% of the city of New Orleans. Review of Corps of Engineers' projects has also been criticized for its lack of impartiality. The investigation of levee failure in New Orleans during Hurricane Katrina was sponsored by the American Society of Civil Engineers (ASCE) but funded by the Corps of Engineers and involved its employees. Corps of Engineers projects can be found in all fifty states, and are specifically authorized and funded directly by Congress. Local citizen, special interest, and political groups lobby Congress for authorization and appropriations for specific projects in their area. Senator Russ Feingold and Senator John McCain sponsored an amendment requiring peer review of Corps projects to the Water Resources Development Act of 2006, proclaiming "efforts to reform and add transparency to the way the U.S. Army Corps of Engineers receives funding for and undertakes water projects." A similar bill, the Water Resources Development Act of 2007, which included the text of the original Corps' peer review measure, was eventually passed by Congress in 2007, overriding Presidential veto. A number of Army camps and facilities designed by the Corps of Engineers, including the former Camp O'Ryan in New York State, have reportedly had a negative impact on the surrounding communities. Camp O'Ryan, with its rifle range, has possibly contaminated well and storm runoff water with lead. This runoff water eventually runs into the Niagara River and Lake Ontario, sources of drinking water to millions of people. This situation is exacerbated by a failure to locate the engineering and architectural plans for the camp, which were produced by the New York District in 1949. Bunnatine "Bunny" Greenhouse, a formerly high-ranking official in the Corps of Engineers, won a lawsuit against the United States government in July 2011. Greenhouse had objected to the Corps accepting cost projections from KBR in a no-bid, noncompetitive contract. After she complained, Greenhouse was demoted from her Senior Executive Service position, stripped of her top secret security clearance, and even, according to Greenhouse, had her office booby-trapped with a trip-wire from which she sustained a knee injury. A U.S. District court awarded Greenhouse $970,000 in full restitution of lost wages, compensatory damages, and attorney fees. ^ a b "About -- Headquarters U.S. Army Corps of Engineers". usace.army.mil. Retrieved 2015-01-12. ^ "Historical Vignette 009 — How the U.S. Army Corps of Engineers Became a Major Army Command". U.S. Army Corps of Engineers. Retrieved 2011-06-11. ^ "Biography of Debra M. Lewis". Retrieved 2014-10-08. ^ a b "Headquarters U.S. Army Corps of Engineers". army.mil. ^ "Mission and Vision -- Headquarters U.S. Army Corps of Engineers". army.mil. ^ a b c d The U.S. Army Corps of Engineers: A Brief History, U.S. Army Corps of Engineers Headquarters. ^ Wade, Arthur P. (2011). Artillerists and Engineers: The Beginnings of American Seacoast Fortifications, 1794-1815. CDSG Press. pp. 22–84. ISBN 978-0-9748167-2-2. ^ "Headquarters U.S. Army Corps of Engineers > About > History > Brief History of the Corps > Improving Transportation". army.mil. ^ "Lake Survey". Greatlakesmaps.org. Retrieved 2012-10-09. ^ Bell, William Gardner, Commanding Generals and Chiefs of Staff, 1775–2005: Portraits & Biographical Sketches of the United States Army's Senior Officer (Washington, D.C.: Center of Military History, U.S. Army, 2006). ISBN 0-16-072376-0. ^ "Historical Vignette 113 - Hide the development of the atomic bomb". US Army Corps of Engineers Official Website. Retrieved 31 October 2012. ^ "Historical Vignette 034 - the Corps Built the Pentagon in 16 Months". US Army Corps of Engineers Official Website. Retrieved 31 October 2012. ^ "Headquarters". U.S. Army Corps of Engineers. Retrieved 2012-10-22. ^ "Map -- Headquarters U.S. Army Corps of Engineers". U.S. Army Corps of Engineers. Retrieved 2018-04-27. ^ "Honolulu District Corps of Engineers". Poh.usace.army.mil. Retrieved 2012-10-09. ^ "''Engineer Magazine'' article "Disaster Relief"" (PDF). Retrieved 2012-10-09. ^ "USACE Institute for Water Resources: Programs Overview". Iwr.usace.army.mil. Retrieved 2012-10-09. ^ Carter, Nicole T. (June 1, 2018). Army Corps of Engineers: Water Resource Authorization and Project Delivery Processes (PDF). Washington, DC: Congressional Research Service. Retrieved 5 June 2018. ^ Frittelli, John (June 1, 2018). Prioritizing Waterway Lock Projects: Barge Traffic Changes (PDF). Washington, DC: Congressional Research Service. Retrieved 8 June 2018. ^ "USACE largest owner operator of hydroelectric power". Operations.sam.usace.army.mil. Archived from the original on 9 January 2009. Retrieved 9 October 2012. ^ "Infrastructure Report Card". Infrastructure Report Card. Retrieved 2012-10-09. ^ "Branch eBook - Military Science and Leadership". Sites.google.com. Retrieved 2012-10-09. ^ Grunwald, Michael (2007-08-02). "''Time'' Magazine article". Time.com. Retrieved 2012-10-09. ^ "Close the Mississippi River Gulf Outlef — The Hurricane Highway". Mrgomustgo.org. Retrieved 2012-10-09. ^ Colley Charpentier. "Critics of Corps investigation". Blog.nola.com. Retrieved 2012-10-09. ^ "IPET Leadership" (PDF). Retrieved 2017-01-16. ^ "U.S. Army Corps of Engineers Home website". Usace.army.mil. 2012-09-25. Retrieved 2012-10-09. ^ Terry Baquet, The Times-Picayune. "Water bill passes despite Bush veto". Blog.nola.com. Retrieved 2012-10-09. ^ Davidson, Joe, "A Bittersweet Win For A Whistleblower", Washington Post, 27 July 2011, p. B4. This article incorporates public domain material from the United States Government document "The United States Army Corps of Engineers website". This article incorporates public domain material from the United States Government document "Miscellaneous USACE History Publications". Stars and Stripes (1945). Engineering the Victory: The Story of the Corps of Engineers. Retrieved 2014-11-11.